The variegated hydrangea is an excellent choice for your shrub border or to accent your garden. 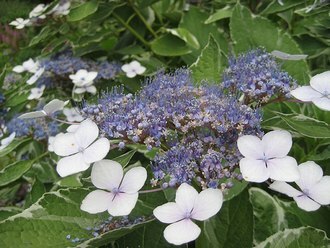 Its beautiful lacecap flower heads are a spectacular blue when grown in acidic soil. Alkaline soil will make the flowers pink. Blooming season is from May to July. It brightens up a semi-shady area and grows quickly. The large green leaves have creamy edges and small patches, making quite a sight itself even when the plant is not in bloom. This is a nice shrub wherever you plant it. Use the flowers in cut arrangements. The plant is deciduous, and will lose its leaves in the winter. This delicate looking bush is easy to care for and it is not a favorite of deer. A variegated hydrangea makes an excellent border background plant. It can make a lovely loose hedge or plant it along a fence line. When it flowers it steps into the limelight. If you plant it in acidic soil, the flowers will be a gentian blue. They are equally as pretty when they remain white. Do a mass planting if you want a large display. This plant works well under large trees. You can put it into a container if you want to have this gorgeous plant on your deck. It also makes a good cut flower. It works best in a woodland garden. Variegated hydrangea pairs well with red Japanese maples, golden deodar cedar, weeping blue Atlas cedar and plantain lily. Plant your variegated hydrangea in slightly acidic soil. Rich, well drained soil is much appreciated by this plant though it is somewhat adaptable. It does not like drought, so water it regularly. In early spring, use an acid fertilizer to promote blue flowers. Prune into shape after flowering. In colder areas, the plant will need some protection from freezing. Cover with burlap or a blanket. Container plants can be kept on a sheltered deck or in the garage. This hydrangea is easily propagated by cuttings. Simply dip them in rooting hormone powder and place them in some sterilized playground sand. Water them and watch their moisture level. In a couple weeks you'll have some new hydrangeas to add to your garden.